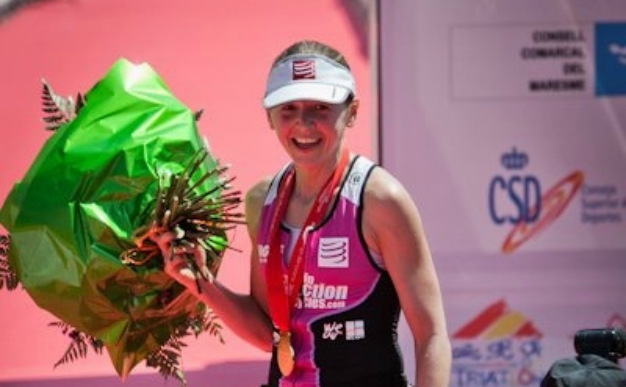 But to inspire you even further we caught up with athlete Sophie Radcliffe who completed her first Ironman this year in Wales finishing in an impressive 13 hours. 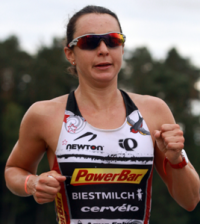 Here we find out just how she managed it, her advice to aspiring Ironmen and her aims for the World Championships. How did you first get involved in Ironman? I’ve been doing various challenges for about six years, and I’ve loved it. I set myself the goal of doing Ironman because its such a massive endurance test and i just thought: ‘I’ve got to do it’. I bought a book called ‘how to train for an Ironman’ and on the first day of training I was like ‘wow I’ve got to do all this stuff and its going to be so much training’. But I soon realised that wasn’t the way to go about it because it’s not a one size fits all thing. What was the appeal of Ironman? It’s a massive test of just how deep you can dig and how much you can push towards your dream. It’s something that you set yourself as a goal and whether or not you achieve it is 100% within your own hands which I like. You may say ‘oh I want a promotion’ but your boss has to give you that promotion, that’s down to someone else whereas becoming an Ironman is completely your responsibility. What was your training schedule like leading up to Ironman? I struggled with my training quite a bit because although I do love training I’m not the type of person who naturally goes out running everyday. There are a lot of people who feel really guilty when they don’t go to the gym or don’t do a training session, but I love days off it! I love going out for drinks with friends or having dinner and eating things I’m not supposed to eat because that’s real life, I’m not going to put my life on hold. I had a good level of endurance already and because I’ve done six or seven 24 hour style events I knew I could keep going for 24 hours. What I didn’t know was whether I could run a marathon, it’s completely different to getting on your bike and cycling 200 miles. My strategy was to build up my endurance and then give myself big mental challenges. I did a lot of mountaineering in the summer and I did some big bike rides that really pushed me, I wanted to put myself in the zone where you just have to keep digging deep. How did you juggle all your training with still maintaining a normal life? I wasn’t prepared to put my life on hold for Ironman. I’ve known people focus on nothing else for nine months, training every day, twice a day and come the event they’re not excited, they’re just burnt out. I had an amazing coach called Mark Kleanthous and he was brilliant. He made me realise I didn’t have to train all day everyday. Instead I steadily build up my endurance and then from eight weeks out I focused on more specific training. Were there periods of the race when you thought you may not finish? I definitely knew I would get there eventually, but there were moments when I thought, ‘this is ridiculous, I can’t do this’. At about 40 miles into the bike ride I was exhausted. 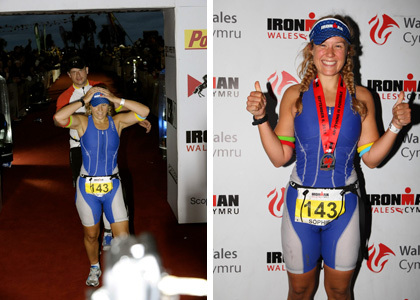 Wales is the toughest Ironman; it’s so hilly and the weather was atrocious, but I always knew I would finish. 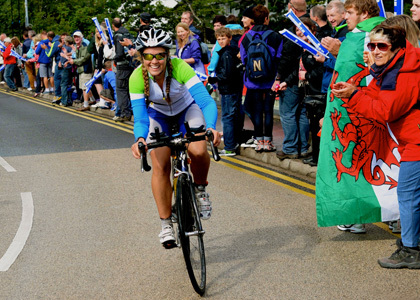 The crowds were incredible, running through Tenby people were coming out the pubs and cheering us on, it was brilliant. My mum and my mother in law were there, as was my husband and when I finished and they were leaping around as if they were at a slumber party, they were so proud, it was amazing. What was the feeling like when you crossed the finish line? On the last run you turn left instead of right and go down a ‘magic carpet’ to the finish. It’s called the magic carpet because it instantly turns pain into pleasure! Then you cross the line and they said: ‘Sophie Radcliffe you are an Ironman’! then they put the medal round my neck and it was ridiculous. It was an amazing feeling. Normally I’d be straight in the pub having a beer, but I was absolutely shattered. My family were with me and we went back to our cottage, they’d brought me champagne and made me chocolate cake and we got Chinese takeaway. However it was weird because I couldn’t eat or dink any of it and I couldn’t sleep at all! My body had been through so much stress. I’d never felt like that before, normally I always love to eat, drink and sleep afterwards but I couldn’t sleep for about a week afterwards! What drives you to take on these challenges? It’s simple really. All the challenges I’ve done have completely transformed my life. After the first one I did I always felt there was something missing, it great doing well at work, but I need something else in my life. I signed up for a race in Borneo and I was hooked. I came back so energised and positive, I was ready to apply everything I’d learnt in the outdoors to work and to all areas of life. All the things I think are really important in work, such as setting goals, overcoming obstacles and being resilient and determined correlate with Ironman, you can prove to yourself that you can achieve way more than you thought you could achieve. There are loads of things I want to do. I do these challenges not because I want to be the fastest or the best or come first, I do them because they push me mentally and physically and because I want to have fun and share them with people. I haven’t done anything since Ironman as I’ve actually completely changed my career and that’s been my current challenge. I’ve got plenty of ideas for next year though, I want to go back to Ironman Wales definitely and see how much faster I can go and if there’s the chance I could qualify for the World Championships. What advice wold you give to someone thinking of tackling an Ironman? I would say make sure your motivation is there otherwise you wont be out there training when its dark and cold and wet. You’ve got to learn to love that part of it, the journey towards Ironman was just as important for me. 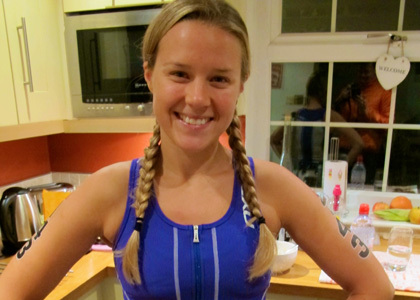 It wasn’t just all about: ‘oh wow I’m an Ironman’ it was more about how I worked to get there. I’d encourage anyone considering it to give it a go, it’s life changing and once you’ve done it nobody can ever take away the fact you are an Ironman. Sophie would like to say a special thank you to her sponsors SportPursuit and her coach Mark Kleanthous from Ironmate. For more info please visit www.sportpursuit.com or www.ironmate.co.uk. To read more about Sophie just visit her website www.challengesophie.com or follow her on Twitter @challengesophie.